Add/Change product category can help you customize this software to your needs. All product categories can be modified, deleted or changed. You can even specify completely new group categories and customize this software to any business type. � To make a new category, type new name and press 'Save' button. � To change category name, just select category from list, change name and press 'Save' button. 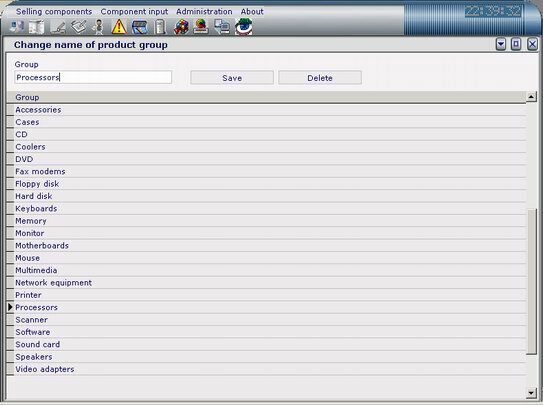 � You can DELETE each of the product categories by pressing on 'Delete' button. and later at component page, add mobile phones as components, and work with it as you work with computer somponents! copyright � noproblemsoft 2001-2008. all rights reserved.